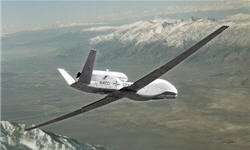 March 11, 2011 – The U.S. and South Korea have reached a handshake agreement for the sale of the Global Hawk unmanned surveillance aircraft, according to program sources. The sale, which could take place as soon as this year, will include four of the high-flying UAVs. Though the Global Hawk is designed to carry a variety of payloads, including imagery sensors, radars and signals intelligence collectors, South Korea has been approved for the Block 30I version, which includes an electro-optical/infrared system. Seoul eventually would like a signals intelligence capability; but the U.S. is reluctant to sell its Airborne Signals Intelligence Payload, so a payload has not yet been selected for that requirement, a program source says. First delivery is expected by 2014. Notification of the sale to Congress is expected soon. Several countries in Asia have been interested in buying the Global Hawk, including Japan, South Korea and Singapore. A version of the Global Hawk is being developed for the German Luftwaffe’s signals intelligence collection demands, and NATO has selected the Block 40 platform to carry its next-generation Air-Ground Surveillance sensor. However, the range and payload capacity of the aircraft — nearly 3,000 lb. — subject it to the restrictions of the Missile Technology Control Regime (MTCR). This entry was posted in Hobbies and Toys and tagged aircraft replicas, airplane models, century wings diecast airplane models, Collectibles, desktop models mahogany models, diecast model airplanes, Hobbies and Toys, military models. Bookmark the permalink.